The number of uncontested seats at some local elections has reached "epidemic proportions", the head of the UK's returning officers' organisation says. John Turner, of the Association of Electoral Administrators, said it showed the electorate's "apathy or disinterest" with local government. 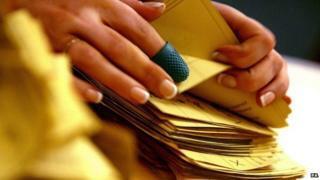 More than 9,000 councillors will be elected across 279 local authorities. Local government responsibilities include providing bin services, libraries, some schools and social services. When the same seats across England were up for election in 2011, about 3% of councillors were returned unopposed. This year Mr Turner expects that figure to rise. In the picturesque Suffolk village of Cavendish, locals will be voting for the first time in 42 years on 7 May for a councillor. For the past 12 years, Conservative Peter Stevens has stood unopposed, but now he will face a challenger - Stuart Letten, of UKIP. Mr Letten said the current situation did not "serve democracy well" and it was time for an alternative voice. Mr Stevens admits finding it unusual to see his face on the election posters. Asked why he has had no competition for so long, he said: "Perhaps we represent the ideas of most of our electorate". "My understanding is... it's a larger figure than four years ago," he told BBC Radio 5 live. "It's part of the wider barometer of apathy or disinterest from the electorate with politics in general and local government in particular and it is unfortunately a trend that is increasing year-on-year." He added that local government budgets had been squeezed in recent years, meaning the ability to "do really creative things" was fast disappearing - and that turned people off. "I think what we're seeing is a sort of democratic deficit," he said. There were some "appallingly low" turnout figures for local government over the last 10 to 20 years, he added, citing a Liverpool ward byelection where less than 5% turned out. "Once we get down to that sort of figure, then really you do wonder whether the person elected unopposed has any mandate at all." "It is not an inexpensive business. "As activists within the parties disappear, their numbers are dwindling, then it starts to raise a question about whether in the public interest there should be some public funding for parties to ensure that they do introduce competition in all seats."